Wilmington, Vermont, 1998 –Saturday morning - up at 5am, still dark. Shower, shave, catch bus at 6am. Start work at 6:30am. Thirty minute paid break at 11am. “Remember to smile for the tourists!” Catch 6pm bus home. It’s dark out. East dinner, sleep, wake at 5am. Repeat process 6 days a week (minus two hours Monday-Friday). Don’t plan on celebrating Christmas. The Christmas weekend is the busiest time of the year. Out-of-state tourists flock to ski areas to spend quality time with their families during the holidays. This is the duality of the Mount Snow worker and the Mount Snow tourist. According to Snow management the average tourist spends $60 per day at the slopes. Up to 2/3rds of Mt. Snow employees are paid between $51 and $63 a day (before taxes). The tourist can afford to not work. The Snow employee, with no or little paid sick leave, can’t afford to miss work. Of course such discrepancies in situations, between worker and tourist, between Vermonter and out-of-stater, are unfortunately hard to avoid given Vermont’s increasing reliance on tourism as a staple of the Green Mountain economy. Presently there are 27 ski areas in the state. The majority of these are owned by out-of-state interests. These 27 areas directly employ 11,000 workers. 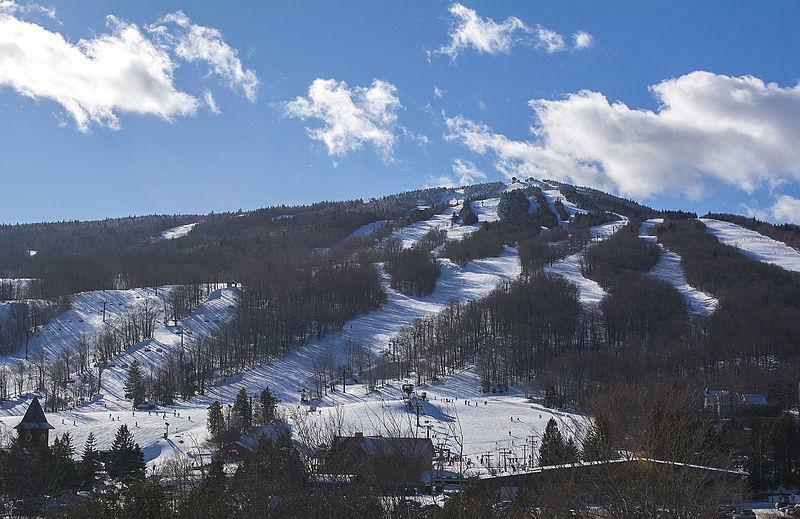 According to the Vermont Ski Areas Association another 11,000 jobs are contingent on these establishments. With a total workforce of 332,000 [Vermont Department of Labor], slightly more than 6% of in-state jobs are reliant on the ski industry. In turn, this industry is estimated to generate $750,000,000 of revenue a year (much of it ultimately going out-of-state). While it is clearly good that 22,000 workers can find employment, it is not so clear if these workers are treated fairly. Take for instance the real life situation of the average Mt. Snow laborer. Snow (as a subsidiary of the American Ski Corporation) employees 1200 workers. According to a source in Mt. Snow management, 600 to 800 are paid $6 an hour. An additional 100-300 are paid up to but not more than $7.50 an hour. Many of these employees also suffer stagnant wages. One current lift operator (who wishes to remain unnamed) still only receives $6.25 per hour despite 7 seasons of service. Compare that with the $6 per hour paid to any starting employee at the same position. These wages must be viewed in comparison with the Burlington based Peace & Justice Center’s findings that a livable wage for a single rural Vermont resident is no less than $7.98 per hour. For a two parent single wage earning family with two children, the livable wage is recognized as $14.94 per hour [Vermont Job Gap Study, January 1997]. These findings are based on a 40 hour work week and assume 80% of one’s health insurance is paid by the employer; coverage Mt. Snow typically does not provide. In addition to poverty wages, the overwhelming majority of Snow employees must fend for themselves in regards to health and dental insurance. Snow refuses to provide such basic benefits unless a worker is a year-round employee. And of course, given the seasonal nature of the business 90% of its employees are laid off in April. Likewise, Snow’s 401K retirement benefit is also refused to all non-year-round workers no matter how many hours and seasons they have been with the company. Thus middle aged workers such as Willy Frommelt, who have been with the company for several consecutive seasons, have little economically to look forward to in their later years other than the uncertainties of social security. Snow, for their part, have been billing their employment opportunities less as a means to make a living, and more as a way to spend the winter skiing for free. While Snow does issue its workers free lift passes, it is a meaningless token to the many employees who only receive one day a week off and the others working from sun up to after sun down. The reality of the majority of laborers is that they do not seek out Snow as a place to ski for free, but rather as one of the few places of employment given the area’s tight job market. For these workers Mt. Snow could very well be a local factory or machine shop (if NAFTA did not already drive those out). So why is it that Snow neglects their laborers in this way? Could it possibly be that Snow simply does not generate the necessary revenue required to uplift the working and living conditions of their employees? That would seem a weak defense for such exploitation given the fact that management admits that each of the half-a-million seasonal customers generate $5 of pure profit per visit to the slopes. Such an economic rebuttal would also seem hollow insofar as Snow is currently sinking $18 million into the construction of a new Grand Summit Hotel. In addition, this season alone Snow has invested $400,000 into employee training and orientation. The stated goal of the trainings is to keep workers happy. To quote Snow’s PR Director Melissa Gilotty, “If the staff is not trained properly they will not be happy and may quit.” I find it fascinating that presumably the shareholders & management 1.) view training as a means to pacify labor rather than a way to increase job expertise, and 2.) that management is concerned with worker loyalty, yet refuses to provide any concreate basis from which that loyalty could evolve (i.e. medical/dental insurance, better wages, pension plans for all full time employees). It is clear that Snow does have the required revenue necessary to do right by its laborers, but Snow would rather invest that money in further profit making ventures and ‘pacification programs’ rather than in the material wellbeing of its employees. One could argue that a ‘temporary’ stagnation of wages and benefits is a justifiable sacrifice in that such moves would free revenue in order to expand Snow, and that this growth could have a positive impact on the local economy (here I am specifically speaking about the construction of the Grand Summit Hotel). The logic basically being that the expansion of Snow will create new jobs, and attract more out-of-state money. Theoretically this money would find its way both directly into Snow and independently owned businesses in the area. This new money would result in growing profit margins for Snow, and sometime in the future, these increased profit margins would result in the ability to pay higher wages and increase access to benefits to its employees. But unfortunately neo-Reaganism trickle-down-economics, due to the human/capitalist tendency towards greed and gross accumulation of wealth, has time and again shown itself to be without merit on the micro level, and formula for increased unemployment and economic recession on the macro level. In reality, the trickle-down practice has not resulted in workers being uplifted, but instead in upper-management and shareholders siphoning profit into their own pockets at a rate faster than they can spend it. Thus the old capitalist truth that “the rich get richer and the poor get poorer.” In brief, history does not tell us we should expect wages to keep pace let-alone catch up to any increased profits. I grant that the present expansion of Snow will result in the formation of approximately 200 new jobs. But how many of these jobs will be at $6 per hour with no benefits? All? 90%? It should also not be assumed that this expansion will have a positive impact on the broader local economy. In fact, the opposite may be true. For example, what will adding more on-site rooms at Snow do to the independent inns? If local inns capture less business will better paying jobs actually be lost? If or when Snow does expand its retail in more general ways, the result could be far from desirable from the point of view of local merchants. For instance, imagine the catastrophic impact that the opening of on on-site bookstore could have on the Bartleby’s Bookstore located in downtown Wilmington? Imagine what could happen to any independent retailer that had to compete with an expanded on-site, Snow owned and operated shop. In the final analysis, the material expansion of Snow comes at a cost to the Snow worker, and (if left unchecked) eventually may result in the subjugation of the surrounding area to the sole standing major capitalist employer – Mt. Snow. In closure, the poor economic standards subjected upon Snow’s labor force is very real and very serious. Such poor wages and lack of benefits are a direct result of the shareholder’s & management’s failures to recognize its employees’ value as workers and as human beings. The shareholders & management would rather pay these folks a base minimum necessary to keep them functioning and minimally content rather than allow them to reap the benefits generated by the corporation’s profit margin. The existence of any profit margin in any corporation ultimately owes its entirety to those who maintain and facilitate a safe workable environment. I will therefore end this commentary with an invitation to the workers of Mt. Snow to organize a union which can act as an advocate for your’ demands and as a community voice. The mobilization of Snow’s workforce into a strong union & the exertion of community control over its future direction are the goals which should be supported by all those Vermonters who value the liberating traditions upon which this state was founded. Note from the author (David Van Deusen): This article was provided to a number of Mt. Snow workers. I myself worked there for a period of time during the winter of 1998. The article was also sent to a number of Vermont newspapers as well as some socialist newspapers. Frankly, in the age before the internet was common in Vermont, I do not know where or if it was published. At the time I wrote this article (and while working at Mt. Snow) I was crashing at my friend Christine Linn’s apartment in Wilmington Vermont.